Am I Exercising My Aussie Enough? Hello! 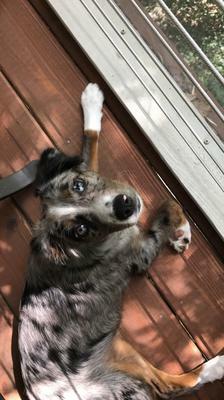 I have a 5.5 month Aussie, Luna. She is my first Australian Shepherd! She is an amazing dog, but I find myself worrying about her exercise needs. During the week, she gets 1-2 daily long walks (2+ miles) and a couple shorter 15 minute walks in between. On the weekends we go to the dog park or drive out somewhere to walk/hike. I have another dog, and they enjoy play fighting, and we take both of them to a half acre field a few times a week to run around as well as some fetching toys and tug of war inside. We do 1-3 short training sessions a day, and she is enrolled in a puppy class. When she gets older, I would like to begin frisbee and some jogging. She is always falling asleep at around nine at night, and when we aren't able to play with her right away, she doesn't seem to mind napping or chewing on a toy. Am I doing enough? Every time that I go on and Aussie-related website it says that Aussies need TONS and TONS of exercise. Am I doing enough? Comments for Am I Exercising My Aussie Enough? From what I have read--they need 1 to 2 hours a day in a fenced yard (to run free) it sounds like you are doing enough. We go for a walk in the morning-not on a lease as we live in the country) play Frisbee when we get home. Play Frisbee and throw her tennis ball later in the day. She runs round with our new puppy and then they are both taken off leash down onto the pathways we have in our pine trees. So I think you are doing fine as our Vet always says she is very healthy. She is 4 years old and the puppy is 11 weeks. Hope this helps.